We are a small family owned and operated Pomsky breeder located 15 minutes outside Sun Valley, Idaho. Pomskies are the perfect companion dogs. We strive to produce healthy, loving, and well-tempered Pomskies! Our family lives on a small farm in Plymouth, Utah. Plymouth is a small town near the Idaho/Utah state border. We're surrounded with farms and ranches. We love the country life. We think it's heaven on earth. We come from a big family of dog breeders. My mom has been breeding long before I started. She taught me everything I know. Now that my husband and I are settled down on our little farm, we have the wonderful opportunity of being introduced to the Pomsky breed; we absolutely fell in love with Pomskies! We are not a mega breeder or "puppy mill". We take great pride in owning just a few dogs. Our dogs have good temperament; they're smart, sweet, kind, lovable and rare. They enjoy a wonderful life without "kennels" here on our little farm. Because our dogs are a part of our family, we raise them in our home; they're use to everyday sounds. They're well socialized with kids. They accompany us on family activities around the farm like horseback riding, rides in the truck, camping, and hiking. They're a loving part of our family! We love our Pomskies and can truly say they are the most amazing breed on earth. I am a small Pomsky breeder all my dogs live in our home and go with us on vacations. We take all our puppies to an early neurological training program and start teaching our puppies basic commands before sending them to their new homes. We are happy to work with all new homes and work with anything specific they want us to help the puppy start learning, including their names. Breeding is a passion that we have grew up around and continued on into our adult lives. We truly love our pack and each puppy that leaves here. Our main goal is to provide the best healthy companions our customers could ask for which shines through in our puppies! Lollipop Pomskies is an in home Pomsky breeder who strives to produce healthy and happy puppies to enrich the lives of others. Our Pomsky goal is to create a true recognized breed that is able to be shown and compete in conformation and performance events by working alongside reputable breeders and associations. All Lollipop Pomskies are thoroughly examined by experienced veterinarian including eyes, ears, skin, joints, heart, lungs, temperature, abdominal and testicles. Beverly Olsen my mother started breeding and grooming dog in 1972. In 1991 she taught me how to groom and taught me how to breed the best of the best and how to improve the breed that I was working with. My son Markus brought the Pomsky breed to my attention in 2012. My friend Lisa pushed me to breed the pomskies saying this is perfect for me. At the time I was finishing my degree in Forensic Science. I now breed Pomskys and I have incorporated my degree in DNA science to research my dogs and test the genetics they carry to produce the best of the best breed pomsky. Mountain Shadow pups are micro chipped, dewormed, socialized and have received all of their first shots. In addition, Mountain Shadow Pomskies offers a 3 year guarantee and all pups have their origin verified through the University of California Davis. We are dedicated to producing happy, healthy, friendly pomsky pups with beauty and brains. All pups are raised in our home with lots of socialization & love. Portland Pomskies was founded in Spring of 2015. Our mission has been to find the most beautiful dogs to create the cutest pomskies in the world! We create Pomskies ranging in size from 5lb-30lb's. The sizes can vary depending on the ratio of husky to pomeranian as well as the different parent pairings. Pomsky Northers is managed by Alma and Heather DeMille. Alma and Heather live on an 11 Acre Ranch in Utah with their 10 children, Pomskies and Great Weimar dogs. Both Alma and Heather each have a long history breeding, training and loving animals, it’s what they do. Breeding is not just a hobby for Pomsky Northerns; it’s their passion, career and family lifestyle! Heather studied Biology and Genetics in college and has passed the AKC Dog breeding courses. She is especially educated and interested in the color genetics of both dogs and horses. Heather has been breeding dogs for over 15 years and has been training dogs since she was 10 years old. Alma spent his childhood assisting his veterinary Grandfather, studied animal nutrition & husbandry in college and is a nationally recognized farrier, breeder, trainer and clinician with a particular interest in Gaited horses. Pomsky Northerns strides to raise high quality animals that bring years of joy, entertainment and companionship to their owners. Alma and Heather’s years of experience and years of study have given them an eye for excellence, making them experts in the field. We are Kirt and Charity McCallister. We have young children who socialize and love on our puppies everyday. We are a small family breeding program in Oregon. We love dogs and especially love Pomskies. All of our pomskies are indoor dogs and do everything with us. they are like family to us and I grew up breeding German Shepherds with my mother since I was 5 years old. Our puppies have great temperaments and are well socialized when they leave to their new families. Our goal is to breed happy and healthy puppies with blue eyes and husky masks. 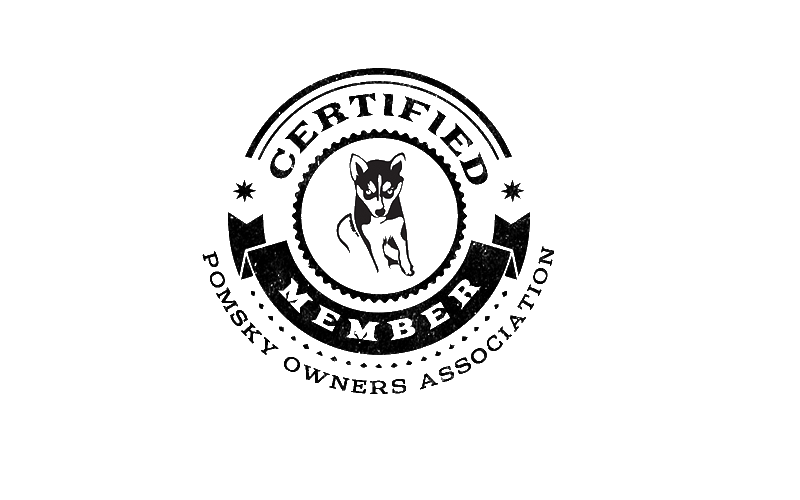 We are members of the International Pomsky Association and hold to the standards and ethics that they stand for. We are located above the Arctic Circle in Northern Alaska, so our puppies are true Alaskans! We have only the best purebred Siberian Husky females and Pomeranian Males so that we can produce the finest Pomskies possible. At Midnight Sun Pomskies our entire goal is to breed beautiful, healthy, and fluffy Pomskies from Alaska! We love the breed, and we want to share that with you. Our puppies are raised in our home as part of the family, and they get to play with other dogs, cats, and are socialized with adult and child visitors alike. Although we are located in Alaska, we do offer shipping to major airports all around the United States. READY TO FIND YOUR POMSKY? Download our complete list of 40+ approved pomsky breeders in the United States and beyond. Find a breeder close to you.